We "visualize" mutielemental and mutldimensional information of the fields of science, medicine, and biology - which is difficult to comprehend - by means of advanced expressive technologies including 3D stereoscopic viewing, and thereby convey such visualized information that feels real through the five senses. This is the mission of META Corporation Japan. 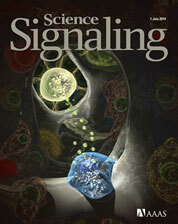 July 2, 2014 Our CG image was chosen as the online cover of "Science Signaling"! November 26, 2013 Medical KOS is now available on the App Store. It's FREE, so please check it out! March 24, 2013 Actioforma KOS is now available on the App Store. March 2, 2013 We gave demonstrations in International Symposium on Development of Medical Technologies for Treating Intractable Cancers and Cardiovascular Diseases. February 12, 2013 Eiji Takaoki, Ph.D, the president of META Corporation Japan, Ltd. gave a lecture and demonstrations in Stereoscopic 3D CG Workshop. update:2015-12-22 Copyright (C) 2010 META Corporation Japan. All Rights Reserved.